Just a couple of days ago, Dead Trigger, one of the most popular apps on iOS that got on Android, was selling for $0.99. Then, it suddenly went down to absolutely free for no apparent reason and the game isn’t freemium. So what happened to make developers from Mad Finger games cut the price? 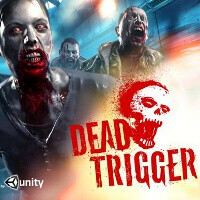 The initial plan for Dead Trigger on Android was to make the game so affordable (at just one buck) that everyone who likes games where you shoot zombies would buy it. However, so many people found the illegal way to download the app off sources different than Google Play, that Mad Finger finally thought it could just give it away for free as some kind of a statement. “Regarding price drop. HERE is our statement. The main reason: piracy rate on Android devices, that was unbelievably high. At first we intend to make this game available for as many people as possible – that’s why it was for as little as buck. – It was much less than 8$ for SHADOWGUN but on the other hand we didn’t dare to provide it for free, since we hadn’t got XP with free-to-play format so far. – However, even for one buck, the piracy rate is soooo giant, that we finally decided to provide DEAD TRIGGER for free. Anyway – DEAD TRIGGER is not FREEMIUM, it always was and still remains FREE-TO-PLAY, that means, all players are able to play it without IAP! We stand up for this statement, because all members of our team are playing (and enjoying) DEAD TRIGGER without IAP,” Madfinger Games explained. So it seems that Dead Trigger is facing an uncertain future - it might end up being ad supported or with more in-app purchases in the game. What’s worse is that this gives Android a bad name for developers who have recently started more aggressively launching apps and games on Google’s platform. In either case, you can still go on Google Play and get Dead Trigger for free. I hope I could donate. They did a very good job with the graphics and all that and people wouldn't even spend a buck. :/ I'm a big zombie fan and... honestly hope they don't lose money. Please add ads, I know I'll hate it but for the sake of Android devs staying on Android. THIS GAME IS CRAP!!! THE MISSIONS ARE REPETITIVE AS HELL AND YOU CAN'T GET ANY OF THE COOL ITEMS WITHOUT PAYING EXTRA FOR THEM. i HATE GAMES LIKE THESE WHERE YOU CAN'T GET THE FULL PACKAGE WITHOUT PAYING EXTRA. POS GARBAGE!!! but I still like the graphics and zombies. much like Diablo 3 and etc. depends on your weapons and stuff. if i could only pay for it in 7-eleven stores, i am really willing to pay all my pirated apps! but damn it i dont have credit card! Hey is this game even worth it? Has anyone played it? Is the game good, should I check it out? I know what you mean. This will really hurt Android & the developers. I am sure they are adding ad's to the game so it's not a total loss. I do agree though. I wish there was a way I could buy this or donate at least. Thumbs up for your honesty. Thumbs down for that fact. :( Me too, although I usually get the free ones. Some apps are said to be incompatible but once I install their APKs, they actually ran fine. That's why I do it. Google is partly to be blamed for this. Many people doesn't have credit/debit cards to purchase apps on google play so they resort to piracy. If google could have given users other ways to purchase apps like iTunes gift cards, people who doesn't have credit/debit cards wouldn't have to resort to piracy. Oh please if some one wants to buy an app they can use 3V cards or any other top up credit cards. Its no excuse. Google is to blame because they make it so easy for people to do it. The problem is that 3v prepaid vouchers are not available to other countries like mine. Exactly, I pirate because I have no other way of purchasing apps. The only way I buy stuff online is via paypal, but Play doesn't support that. So I end up only begging my friends to help me buy apps that are really worth it...Like Apex. just out of question, how do you have a smartphone and the requisite data plan if you don't have a credit card/debit card? and if you are a child/teenager, you can't just pay your parents for what you purchase? I went through a credit check when starting up my original contract...don't remember needing to produce a credit card - something I haven't had for many years. The introduction of PayPal in the play store would be nice, and/or all carriers adopting carrier billing would be appreciated. That's a good suggestion as well, but unfortunately, the two major carriers in our country also doesn't allow google play transactions to be topped up on our bills. I agree, it would really bring up sales it they had Gift Cards. Please, if they really tried they could easily prevent their apps from being pirated. There are many apps out there now that just don't work or annoy the crap out of you if they're pirated. WidgetLocker, Popup Notification, Tasker among others. Even the latest The Dark Knight Rises game needs root in order for it to run sideloaded. Yes, like I said before, I have no way of buying apps, so I usually pirate apps to try it, or if they aren't frequently updated (updating pirated apps that are constatly updated is a pain). The latest version of Tasker doesn't do anything if it isn't genuine. WidgetLocker and Popup Notifications disable itself after detecting it isn't genuine. Even Apex and Nova launcher don't have cracked versions as the unlocker can detect if it's genuine too or not. And some games like those from Gameloft or Square require root and a crapload of steps before being able to run it.